Headed for Wyoming, in 1882..A woman, a team, and a wagon. Gonna make our dreams come true. Settled in the foothills of the big horn mountain slope. Life is sweet we lived on the meat, of the deer and the antelope. We cut house logs on the moutain, with the team we hauled 'em down. Peeled 'em and we stacked 'em up, for a house and bought some ground. Traded for some cattle, and turned 'em out on the range. The skies were blue and we never knew...How things were gonna change. When you brand a man a rustler, he's gotta take a side. There's no middle ground in this Johnson Country War. 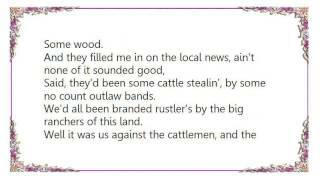 Said, they'd been some cattle stealin', by some no count outlaw bands. We'd all been branded rustler's by the big ranchers of this land. Well it was us against the cattlemen, and the years just made it worse. Then their came the story about the two dry golgia tax. How many men have died upon your shores. There's no middle ground in this Johnson County War. Then last night at supper time, riders stopped by chance. Two men had died this mornin', shot down in the snow. Now the vigilante army was marchin' for Buffalo. Well the county was in an uproar, an every man saddled up to ride. Caught the cattlemen at the TA Ranch, and surrounded all four sides. We hailed the house with bullets and swore we'd make 'em pay. But the calvery came across the plains, and once again saved the day. Well, they marched 'em off to Cheyenne, and no one went to jail. The cattlemen we're all turned loose, and the hired guns hit the trail. And I guess the only justice, wasn't much to say the least. Last winter me and mine ate mighty fine on the cattle baron's beef. Oh Powder River, you're muddy and you're wide.